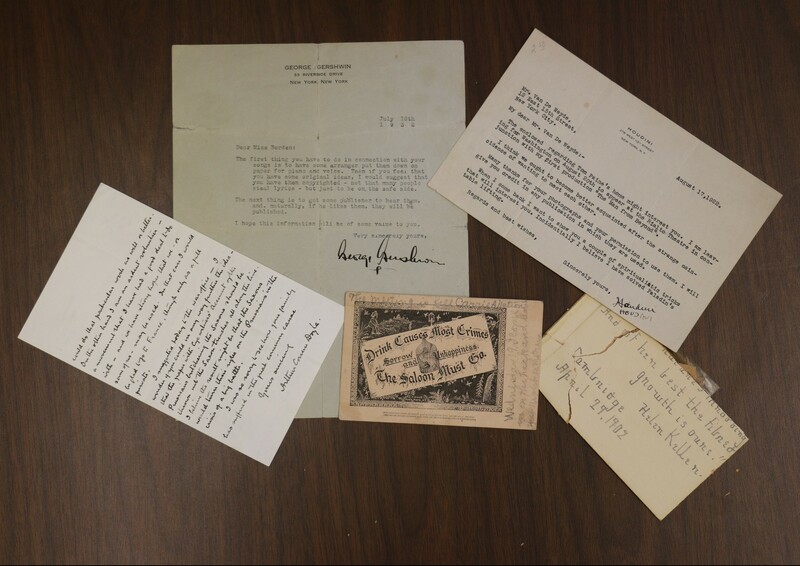 We recently came across two autograph collections in our stacks from collectors named Charles Alrich and Peggy LeBold which we have combined into one collection. Each one was very sparsely described and their catalog entries did not tell the full story of the riches inside. One was collected by Charles Aldrich, who was active in archives in Iowa, helping to establish the Iowa Historical Department. A newspaperman, he founded the Hamilton Freeman paper in Webster City, Iowa. He also had an interest in ornithology and was a founding member of the American Ornithological Union. He broke his collection down into the following seven categories: Authors, Artists and Editors; Iowa Autographs; Reformers, Philanthropists, Educators, Clergymen, Scholars; Rossetti Collection; Scientists; Soldiers, Sailors, and Explorers; and Statesmen and Lawyers. The Rossetti collection is the collection of William Rossetti, editor and critic and brother and Christina and Gabriel Dante, and includes signatures from many of the people in the Pre-Raphaelite movement. About Peggy LeBold less in known. She and her husband Foreman M. (Mike) lived in Chicago and were great collectors. Mike LeBold was president of the Morris Paper Mills. Their primary areas for collecting were presidents of the United States and Lincolniana. Before his death he distributed his collections among many institutions. 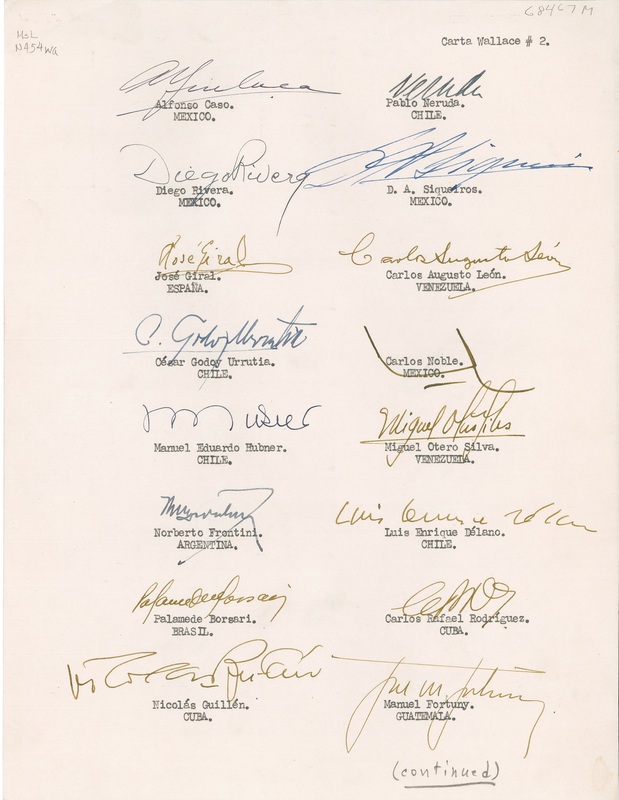 This collection represents many disciplines and contains photographs of some of the signatories. The image contains items from the Le Bold portion of the collection. Reading clockwise from the left are signatures for Arthur Conan Doyle, George Gershwin, Harry Houdini, Helen Keller, and Carrie Nation. 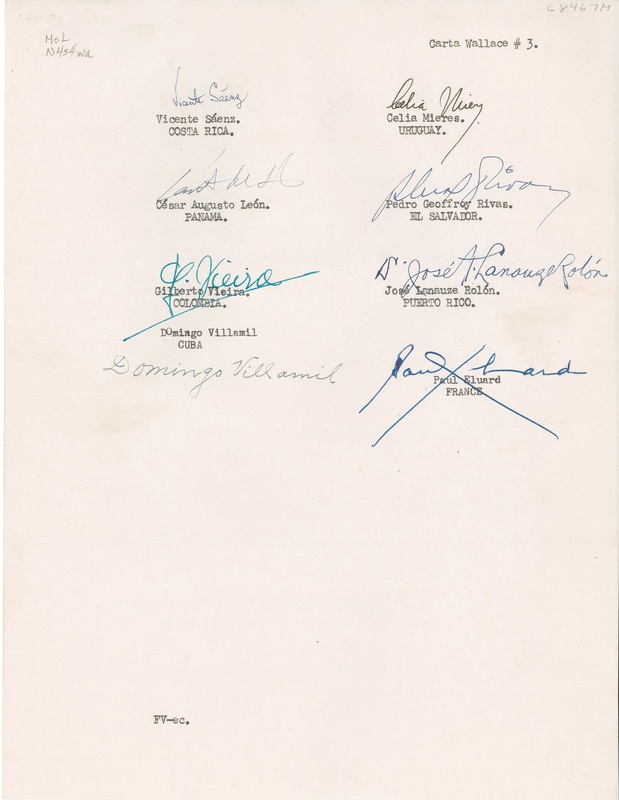 Reading clockwise from the left are signatures for Arthur Conan Doyle, George Gershwin, Harry Houdini, Helen Keller, and Carrie Nation. In the firestorm that was the desegregation movement of the nineteen fifties and sixties, the experiences of two women of color makes a nuanced statement about race and its implications. 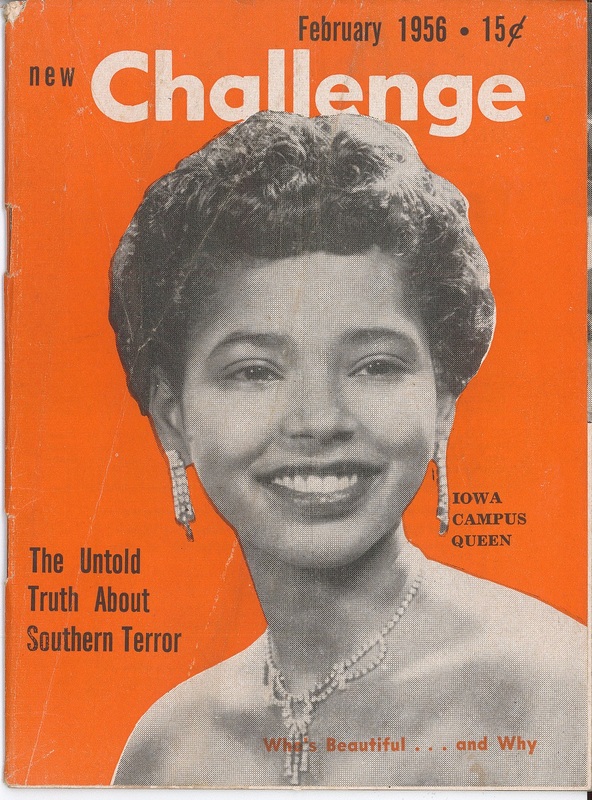 Dora Lee Martin attended the University of Iowa and sixty years ago on December 10, 1955, the seventeen year old freshman from Texas was elected “Miss SUI”. Arthurine Lucy was admitted to the University of Alabama but was denied entry in March of 1956 and suffered many abuses. The two experiences are a telling contrast that was remarked upon in several news clippings from the time. She won the contest by fifty votes. Her election made international news. 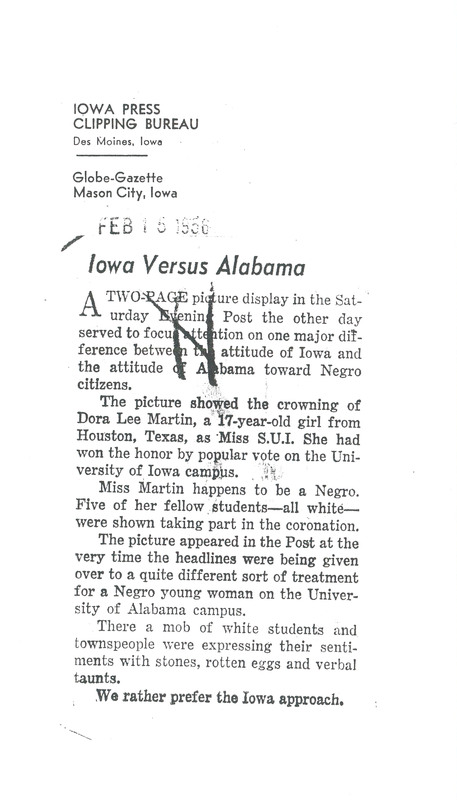 The University of Iowa Archives has clippings in the vertical files from various towns in Iowa (Oelwein, Humboldt, Mason City, Storm Lake, Sioux City, to mention a few), Kansas City, Des Moines, London, New Delhi. One clipping from Cedar Rapids even states that a woman from Cedar Rapids living in Leopoldville, Belgian Congo reported, “The natives were flocking into the office asking all sorts of questions. Could she speak French, did they think she would adopt them to be a godmother and would she be able to come over here on a trip?” Special Collections even has one publication in Arabic, possibly from Libya. Contrast this to Authurine Lucy’s experience just a few months later. She was born one of ten children born to farmers in Shiloh, Alabama. She graduate from high school in 1947 and attended Selma University, a school for blacks, and then transferred to Miles College, another all black institution. 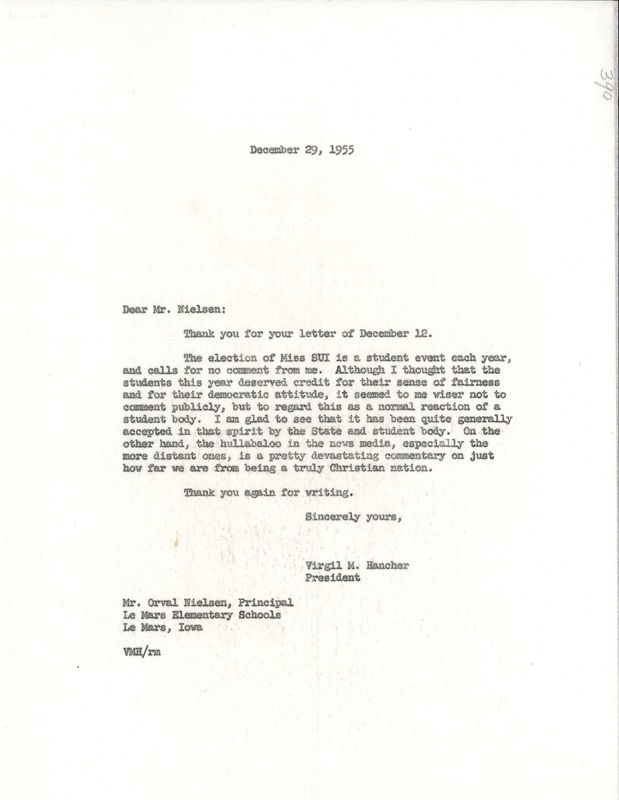 She wanted to be a technical librarian so she applied to, and was accepted, by the University of Alabama in 1952. That is, she was accepted until school administrators discovered she was black. They then told her state law did not allow her to attend. She sued and it took three years for the case to make its way through the courts, but in 1955 the US Supreme Court ruled that she could attend the University of Alabama. However, she was told that she could not stay in the dormitories or eat in the dining hall. She would have to live in Birmingham and make the 51 mile commute each day to Tuscaloosa and faced expulsion and egg peltings. (See Washington Post article below). On the third day of classes — time enough for word to get out that a black student was taking classes — upon arriving on campus she was met with an angry crowd of about 500 people. She was whisked into an auditorium. Meanwhile the crowd had grown to some 3000 people, some of them not connected with the University. She was pelted with rotten produce and eggs. At the end of the day she was suspended, supposedly for her own safety. The student body protested the suspension, and she sued the University again. Sometime during the intervening time, her lawyers accused the administration of colluding with the anti-desegregation protesters, which would have dire consequences later. The courts decided in Lucy’s favor and ordered the school to accept her again. They used the accusation of collusion to say that Lucy had slandered the school and thus she could not be accepted. Exhausted from all the court battles, Lucy decided not to sue again. But that’s not the end of these stories. Martin says she never heard anything positive from the administration of the University. This letter from President Hancher may explain some of this silence but Martin says that the events in which previous campus queens had participated were simply silently cancelled. 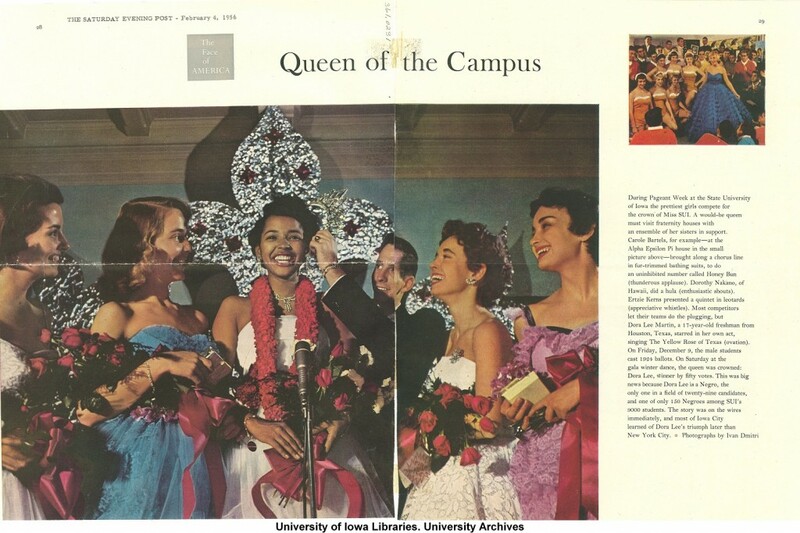 The rules of the pageant were changed so that there was faculty oversight. She got on with her education, but left Iowa before she graduated. She married and followed her husband to Chicago, where she attended Roosevelt University, and finally Rutgers, where she received a Master’s in Social Work in 1969. She worked as a social worker in schools. Lucy also taught as a profession. In 1988, the University of Alabama reversed her suspension and she returned to the University, and in 1992, she finally received a Master’s degree in Education. The University also named an endowed fellowship after her and unveiled a portrait of her in the student union. These two scenarios played out during roughly the same time period. They look like different ends of the spectrum. But were they really? A closer look at the situation reveals that there’s more to each one than meets the eye. 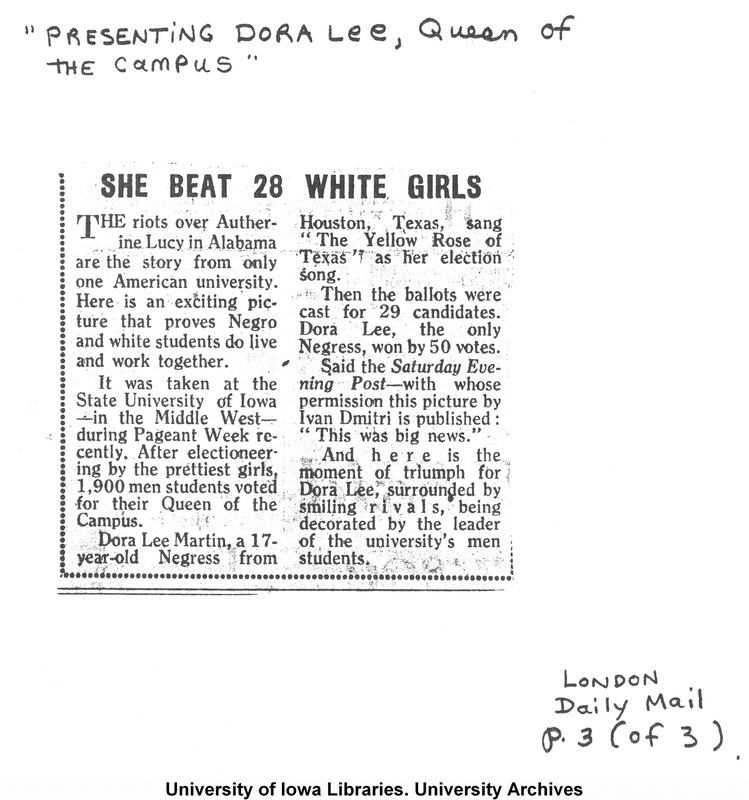 Clippings from Dora Lee Martin Berry’s file in Alumni and Former Students Vertical File in the University of Iowa Archives, RG01.15.01. Cover of the New Challenge is in the Progressive Party Papers, 2015 Addendum – The Progressive Party of Massachusetts. MSC0160. Oral history recording with Dora Lee Martin is part of the Giving Voice to their Memories: Oral Histories of African American Women in Iowa project. IWA0331. 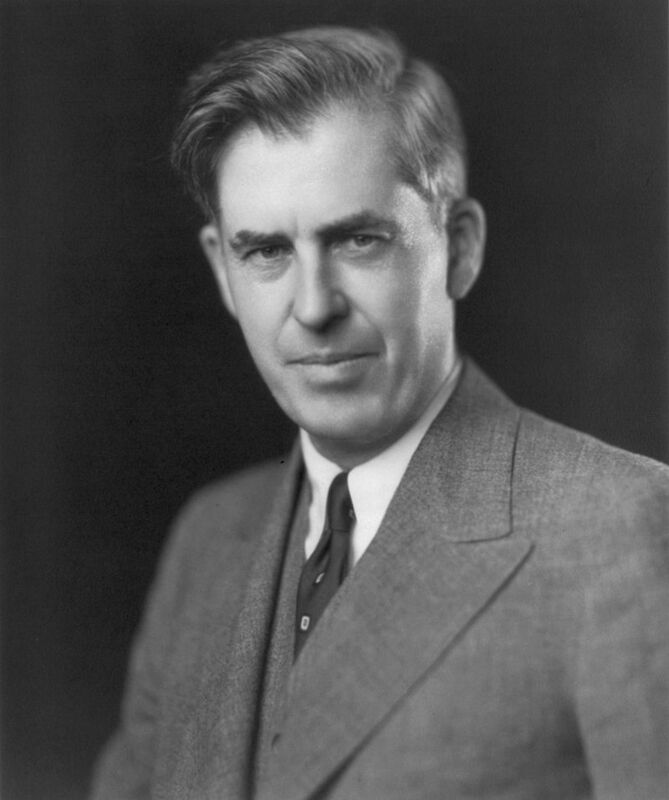 On the 50th anniversary of his death, we remember Henry Agard Wallace, the 33rd Vice-President of the United States, who was a man well ahead of his times. An idealist who experimented to the point of dilettantism, these avocations destroyed his political career, but he would not back down from them. An example of this is his quest for religious fulfillment, which led him to Native American spiritualism, Theosophy, and an odd spiritualism espoused by Nicholas Roerich. This last arguably cost him the Vice-Presidency. Another example is his early stand on racial integration, for which he had rotten tomatoes and eggs thrown on him on a tour of the south during his run for President in 1948. He would also, during this campaign tour, not stay at any hotel which would not accommodate blacks. He proposed making ethanol in the 1930s. He openly criticized the House Committee on Un-American Activities. And he was an advocate for peace. He thought we should share our atomic secrets with the Soviet Union. Since he narrowly missed being nominated for Vice-President in 1944 and succeeding to the Presidency eighty-two days later, who knows what might have happened? Maybe we could have side-stepped the Cold War internationally and the Red Scare at home. Or maybe we would be a Soviet Republic now. 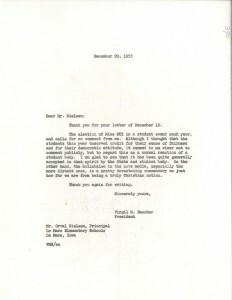 Wallace also spoke Spanish and wanted a closer relationship between the Americas. While he was Vice-President, he travelled to Latin America and endeared himself to audiences by speaking to them in their native tongue. 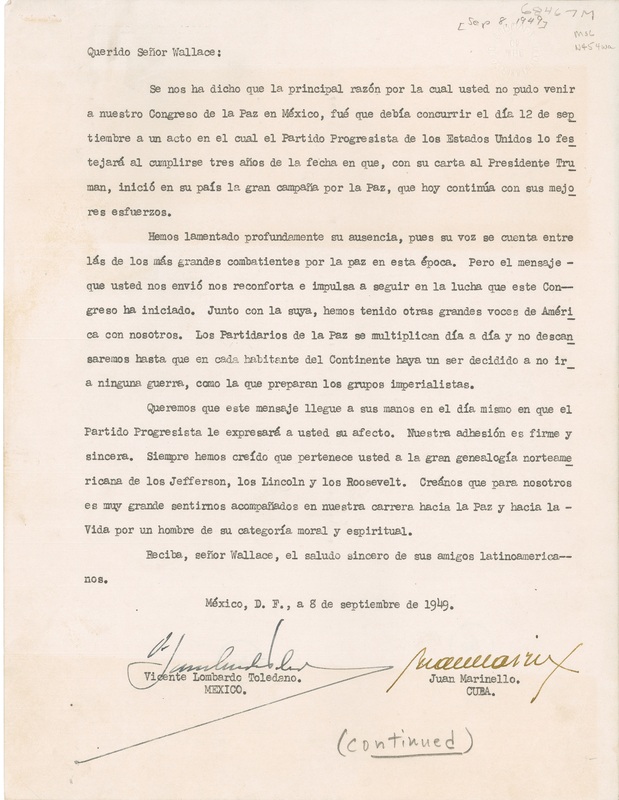 This combination of peace promoter and advocate for Latin American ties comes together in an extraordinary document held by the Special Collections Department at the University of Iowa. 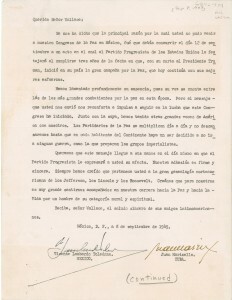 This is a letter signed by many luminaries in the Latin American World, including Pablo Neruda and Diego Rivera. Apparently there was a conference for peace in Mexico City September 5-10, 1949, Congresso Continental Americano por la Paz, to which Wallace was invited. This would have been in the wake of the loss of his presidential run in the 1948 election. Unfortunately, this date coincided with a meeting of the Progressive Party, which was honoring Wallace, so he could not attend the peace conference in Mexico. He conveys only regrets and a statement about world peace in a cablegram sent on September 7. Characteristically, he does not tell them that he is being honored on the third anniversary of his speech at Madison Square Garden, “The Way to Peace.” (CT: We have a copy of this speech and the cablegram sending his regrets.) A search of the internet uncovered two items. One is an image from the Ava Helen and Linus Pauling Papers, Oregon State University Libraries, which looks like the cover of a book of bylaws for the congress. The other item is a linocut poster announcing the conference. We are told that the main reason you could not come to our Congress for peace in Mexico is that you are to attend on the 12th of September, a ceremony in which the Progressive Party of the United States in celebrating what you have accomplished in the last three years, which continue today with their best efforts. We deeply regret your absence because your voice is among those of the greatest fighters for peace in this time. But the message that you send us comforts and encourages us to continue the struggles that this conference has started. Along with it we have other great voices of America with us. Supporters of peace multiply every day and will not rest until every person on the continent is a being determined not to go to any war or to support imperialist groups. We want this message to reach your hands on the very day that the Progressive Party will express to you their affection. Our membership is strong and sincere. We have always believed that you belong to the great lineage of Jefferson, Lincoln and Roosevelt. Believe us that for us it is a very great feeling to be accompanied in our career for peace and to life by a man of moral and spiritual characters. Receive, Mr. Wallace, the sincere greeting of your Latin American friends. Anyone with more knowledge of this conference is encouraged to be in touch. The Henry A. Wallace Papers are housed in Special Collections, including digitized collections. Learn more here. The Battle Creek Sanitarium was opened in 1866 by John Harvey Kellogg and his brother W. K. Kellogg, promoting health through a regimen of dietetics, exercise, hydrotherapy, phototherapy, thermotherapy, electotherapy, mechanotherapy, and enemas. They were joined in this enterprise by C.W. Post. In some areas they were ahead of their time, such as their emphasis on a low fat diet including whole grains, fiber-rich foods, and nuts, as well as getting lots of fresh air and exercise. But other areas were on the fringe and were open to ridicule, such as the treatment the Sanitarium received in the book and movie The Road to Wellville, the title of which is a spoof of John Harvey Kellogg’s book The Road to Wellness. The Sanitarium suffered during the depression and was scaled back in 1933 and permanently closed in 1952. What lives on are the cereals created by the Kelloggs and C.W. Post Companies, derivatives of the healthy foods promoted by the Sanitarium. 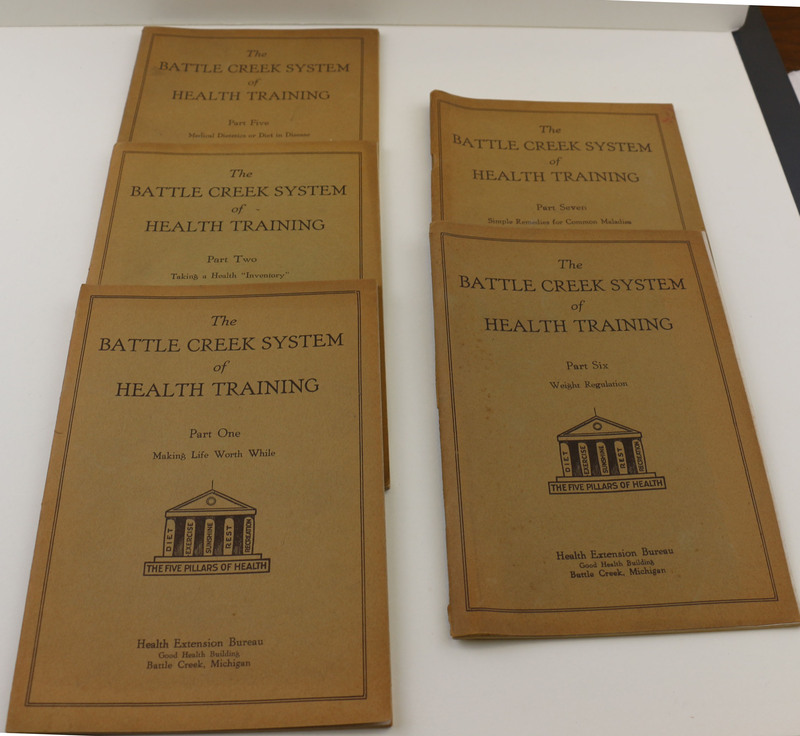 In the Brinton collection we recently found these books, entitled The Battle Creek System of Health Training. While not emanating from the Sanitarium, the books are from Battle Creek’s Health Extension Bureau and carry a publication dates of 1922 and 1924, during the height of the Sanitarium’s popularity. There were seven volumes in the series: 1) Making Life Worth While; 2) Taking a Health Inventory; 3) The Digestibility of Different Foods; 4) Foods and Feeding; 5) Diet in Disease; 6) Weight Regulation; and 7) Simple Remedies for Common Maladies. The books in this collection are in near perfect condition. Unfortunately volumes 3 and 4 are missing so this is not a complete set. On a search in OCLC First Search, only four other libraries were named as having these volumes.